With the Fill N Fun Water Play Mat, young ones can experience water fun without even getting wet! 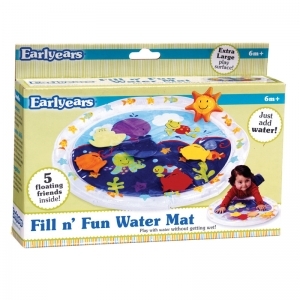 The Fill N Fun Water Play Mat is a great tummy time activity that includes 5 water pals to push and try to grab. Rain or shine, youngsters can have fun in the sun with this brightly colored inflatable play mat that has delightful underwater scenes, fun fish, and a smiley sun painted around the edge. Simply fill the inflatable edge of the mat with tap water and kids can have hours of tactile and visual fun with the Fill N Fun Water Play Mat from Earlyears! This colorful road rug comes with four cars to drive on its looping streets and lanes—and its varied terrain also makes it ideal for trains, chunky play figures, and vehicles of all kinds! 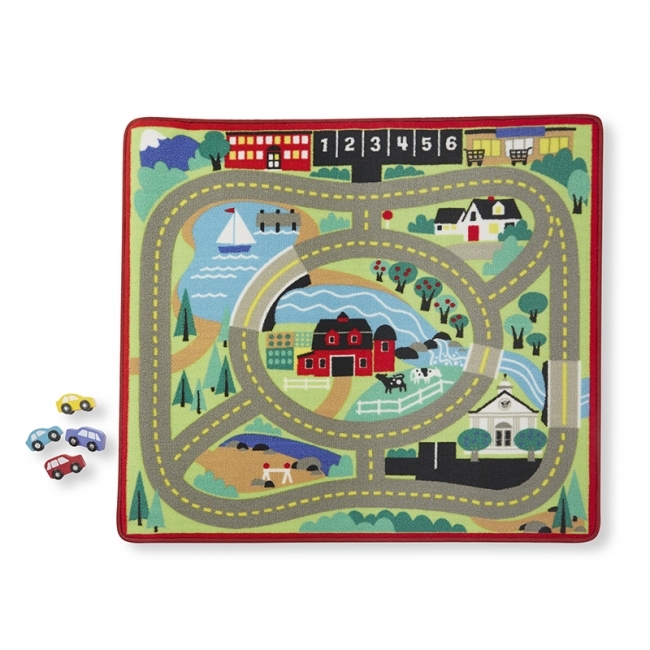 Durably made to look great for countless playtimes to come, the woven rug features a handsome farm surrounded by a circular road system, which connects a school, parking lot, grocery store, lakeshore, and more—all in a uniquely convenient arrangement that makes it easy for a kid to manage it all. Tired of crumpled, ripped or chewed cards? We have the perfect accessory to keep your picture cards from getting damaged during therapy!! The U-Play Mat is a U-shaped mat with 10 clear pockets on its surface that allows a child to sit inside the opening of the "U" while the therapist or teacher sits on the outside. This arrangement creates an excellent setting for eye contact and face-to-face interaction! The U-Play Mat comes with 2 decks of Stages Learning Materials Photo Flash Cards — an Animal Card Deck and a Food Card Deck. 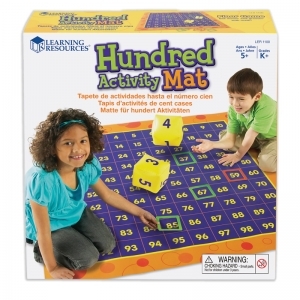 Each deck has 50 cards - 25 matched pairs so you can do matching activities. The cards are 16cm x 14cm, and on a thick and durable card stock, with a glossy varnish that can be wiped off with a damp cloth. The cards feature a beautiful photo image with the corresponding word on one side, and fun facts related to the picture on the reverse. The fun facts serve as conversation starters to help build interaction, vocabulary, and language skills! 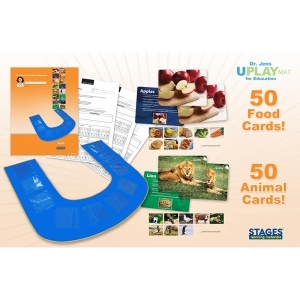 The U-Play mat comes with an activity guide to use as a resource for therapists, educators, parents and caregivers to organize and implement an education program using Dr. Jen's U-Play Mat for Education with Stages Learning Materials Picture Cards. By using the suggested activities as a reference, you can help your team develop a shared language to discuss the child's educational program and maintain a consistent approach during teaching sessions. The guide is fully reproducible, so you can photo copy activities for families to do at home. The Activity Guide includes 19 custom designed, reproducible data sheets. Use these sheets daily to record the child's responses and track his or her progress. All of the suggested activities in the book are easily adapted to a home, school, therapeutic, or rehabilitative setting. The width of the U-Play Mat was also designed carefully to fit a hospital bed for use in an institutional or rehabilitative setting if need be. Brand : THE STIKKIWORKS CO. 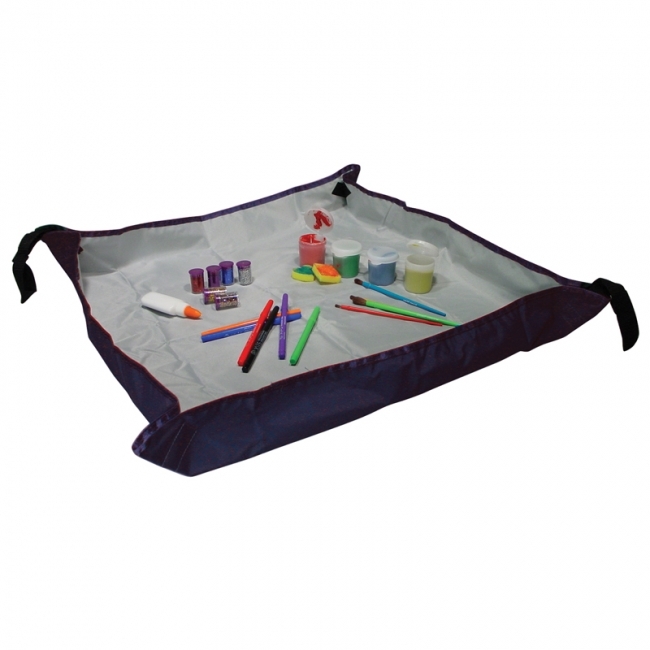 The Sloppy Stopper Activity Mat creates a confined work area for all kinds of messy activities. It also works great to contain small parts for many different hobby and craft projects. Just unfold and pinch hook 'n loop tabs together at each corner to create an 18" x 24" work area with a 2 1/2" high backsplash. When you're finished, simply undo one corner to empty contents, wipe with a wet cloth if necessary, undo the rest of the corners, fold & store. Perfect for potting plants, hobby work, sewing, workshop projects, and much much more!